Grants, loans and work-study are the most common forms of federal aid. Some of these awards don’t need to be paid back, while others will require working. The hardest part for many students is applying. Read on for more information about how to apply and what to expect. Also known as “gift aid”, scholarships never have to be repaid. They are often merit-based and can greatly range in amounts. Scholarships can come from many sources, like the federal government, your college or university or even private or nonprofit organizations. 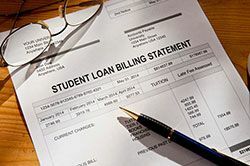 When receiving offers for financial aid, loans are quite common. This money is borrowed and must be paid back, often with interest. Taking out a loan can be scary, so you need to be aware of where the loan is coming from and the terms and conditions of the loan. Funding for school can sometimes come from non-traditional sources. Some companies offer tuition reimbursement, while some community colleges are offering free tuition if certain criteria are met. Before accepting the first financial aid offer, look around for other opportunities, sometimes they can be found in odd places. Tuition price is often the biggest factor that determines where and when someone will go to school. The majority of students don't pay for the full cost of school out of pocket — most receive some sort of financial aid. Grants, loans and scholarships are just a few ways you may get help in paying for school. Understanding the different types and what each offer means can get confusing. Some awards are need-based, while others are merit-based. Every year, millions of dollars go un-awarded because students don’t take the first step of applying. Applying for aid can be daunting, but well worth the time if you are able to save money on school. Find Out Which Scholarship Is Right For You! Serving your country could be a ticket to a free education. To thank current and former military personnel, the federal and state governments, private organizations and colleges across the U.S. offer substantial financial aid packages. Many private schools require the College Board's CSS/Financial Aid PROFILE in addition to the FAFSA, or the Free Application for Federal Student Aid. Here's a guide to filling out this important financial aid supplement. Understanding how government and private student loans work will help you make financial decisions you can live with after you leave school. How much is income-based repayment helping? Student loan debt in the U.S. is nearly $1.2 trillion, and income-based repayment plans are one of the main ways new grads finance their debt. But who are those plans helping most? Tuition exchange discounts can potentially save students thousands of dollars in out-of-state college fess. Learn more about these programs.